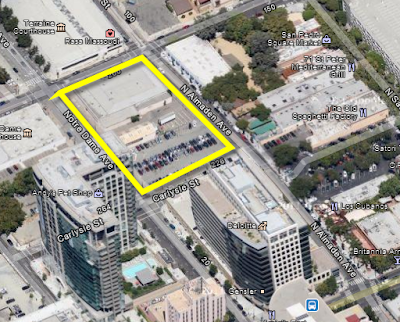 The San Jose Blog: Centerra is Breaking Ground Soon! Centerra is Breaking Ground Soon! 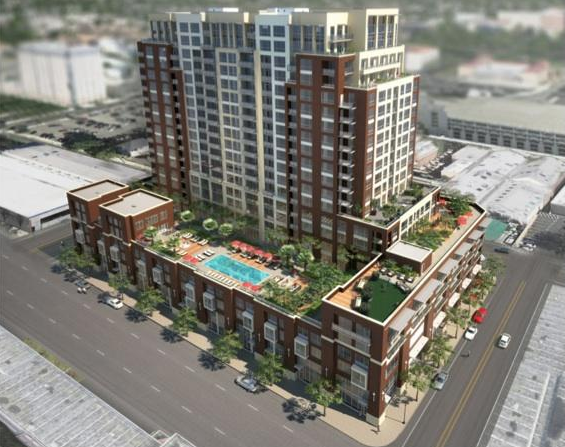 We are getting so close to seeing some shovels in the ground Downtown for two high-rise projects. I'm not sure which one to be more excited about. One South Market have a more central location Downtown, but Centerra is going to be located right across the street from the San Pedro Square Market and will very likely make a substantial contribution to the restaurant, retail, and culture scene that is emerging there. Not only will it be supplying more customers, but the project will be adding retail of its own facing the Market. This is unlikely, but I think it would be pretty amazing if they are able to keep the same small-vendor configuration as the SPSM for their retail to create more synergy in the area. They are targeting the ground breaking for summer and it will take about two years to build out. Can't wait! Good. I'll believe it when I see major construction activities there. It could use all the development it can get since it's the smallest and the weakest downtown for any major cities in country. I just got back from Philly, and it really makes Downtown San Jose look puny and very dead. Check out Philly. It has a downtown that's off the hook! 60 years ago San Jose didn't even have 100,000 residents. Just about every major city in the US has had a huge head start. Also, I would would much rather visit Downtown San Jose than Downtown Jacksonville, Detroit, or Fort Worth... all of which have similar populations. Also, everything seems pointed in the right direction for us to start competing with much larger cities over the next decade. Detroit has a great downtown and it was recently nominated as 9th best downtowns by a survey. What survey? I honestly forgot. I could've been Forbes.com. Detroit did a wonderful job building a football stadium and a basketball stadium. They built casino. Comuware and Quickens have set up headquarters there and so has GM at the Renassiance Center. There's a beautiful park with shops and restaurants downtown. Downtown Detroit is the place to be for the Metro area. Come check it out. It's much larger and more happening than Downtown San Jose. You got to love the Riverwalk park there. Geektown is fabulous with tons of restaurants and local shops. I'd recommend seing downtown and midtown. Just stay away from Eastside and west past midtown. I'll have to check out Downtown Detroit, that is pretty surprising for a city that has lost more than half of its population. Related to above post: The survey concluded that Detroit is 9th best downtown is Toptenz.com. If I were you, Josh, I'd just delete the Philly and Detroit comments. Absolutely nothing to do with this blog, especially from folks who are not even remotely in San Jose or care of it. By the way, Sunflower, One South Market building is ready to go. Heavy equipment have arrived on the site today. We are good to go. I see on sjpermits.org that permits are being pulled for peripheral items for Centerra as well (HazMat, plumbing, electrical, etc), so that project is definitely on. At this point we can be 100% certain that One South and Centerra are going up FOR SURE :) Smiles everyone! Can't til both towers start growing, I really hope that the San Pedro Square condo tower (proposed for the parking lot next to Peggy Sue's) gets brought back to life too (maybe as rentals?). The May Downtown Dimensions is out, it confirms that Ike's will open at the Legacy Towers on 2nd and Santa Clara. They just broke ground on 1 South Market. They'e test piling.